Second Brother On The Right - a new Olympic hero, but he's not competing and no-one knows his name! 'My Dear Second Brother On The Right' has become a Chinese Olympic celebrity - however he's not competing and no-one knows his name! One of the joys of the internet is its ability to create unlikely celebrities. Thanks to the viral nature of the internet everyone is now familiar with the Numa Numa guy, the Star Wars kid, Chad Vader and other unlikely idols. In China the latest internet sensation is around Second Brother on the Right, one of the anonymous guardians of the Olympic torch during the Olympic torch relay. Pictures of 'Second Brother' in his blue and white uniform are all over Chinese websites and one Chinese forum has 542 pages of odes to 'My Dear Second Brother on the Right' - including marriage proposals! My Second Brother is seen as representing traditional Chinese values and an antidote to the manufactured pop stars and celebrities dominating the new Chinese cultural scene. The mystique around the torch guards has been further enhanced by the Chinese authorities keeping their identities secret. So move over Yao Ming, the internet has created a new Chinese Olympic idol! 15.08.08 UPDATE: The story of 'My Second Brother on the Right' has captured the imagination of Olympic viewers across the world. First there was buzz in India that spread to the US as news organisations picked up the story. Most recently the story of 'My second brother on the right' has attracted attention in Canada. 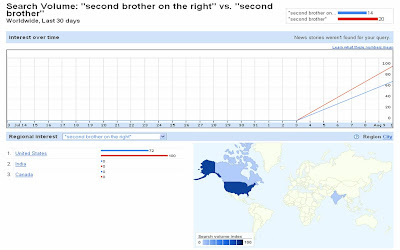 The new Google Insights for Search tool shows how searches for 'My second brother on the right' have grown significantly over the last few days - I wonder whether he knows about the worldwide internet attention he is getting? - Michael Phelps Facebook Fan Page - over a million fans now! he's the king of Samurai,the king of kungfu and the king of the king.Look sign in his body!